Many foods can support the growth of microorganisms that may cause foodborne illness. Potentially hazardous foods such as meat, poultry, seafood, fish and eggs are moist and contain protein, which provide good conditions for bacterial growth. Other potentially hazardous foods include cooked rice, alfalfa sprouts, melons, and baked and boiled potatoes. ■ Select a person who is familiar with food service sanitation to be in charge. Hold a short training session for volunteers. ■ Prepare food in a kitchen specifically designed for quantity food production. ■ Plan ahead! Make sure the location meets your needs. Does it have adequate storage space in the refrigerator and freezer? Does it have the cooking and hot-holding equipment you need? ■ Obtain food from inspected sources. ■ Store and prepare food safely. Refrigerate or freeze potentially hazardous foods in shallow containers within two hours of shopping or preparing. ■ Prepare and cook food safely. ■ Always work with clean hands. ■ Cook food to the recommended safe internal temperature. ■ Never partially cook food for finishing later because you increase the risk of bacterial growth. ■ For best quality and safety, prepare foods close to serving time. ■ Refrigerate ingredients for salads before mixing them together. ■ Wash hands and surfaces that come into contact with food. ■ Don’t cross-contaminate! Keep raw meat away from ready-to-eat foods such as lettuce, melons and bread. ■ Wash cutting boards after use. ■ Cook food to the recommended internal temperature. Measure temperatures with a clean, calibrated food thermometer. ■ Don’t cook food partially for finishing later because that increases the risk of bacterial growth. ■ Keep time between cooking and serving to a minimum; preferably prepare food within several hours of the event. ■ Refrigerate perishable foods promptly in shallow containers. Thick foods such as stew should be no more than 2 inches deep; thinner foods such as soup should be no more than 3 inches deep. ■ Keep refrigerators at 40 F or lower. ■ Keep cold foods cold. Keep food at or below 40 F. Place in a cooler with a cold source, such as ice. ■ Keep hot foods hot. Use insulated containers for hot items such as stews and chili. Pack right before you leave and don’t open them until serving time. ■ Tightly seal and wrap foods. ■ Do not transport food with animals. Note: If you won’t be able keep food adequately hot or cold, serve items such as dried fruit, nuts, peanut butter sandwiches, apples and bananas. Controlling hazards from source to service is the key to safe food. Your local health department or state agency can tell you what types of food can be served under both local and state ordinances. Contact them with any questions you have regarding food offered to the public. It’s their job to make sure food is served safely, not to shut down a community event! ■ Use clean dishes and utensils to serve. “Germs” can survive and grow in food left on utensils. ■ Keep serving portions small when you are not sure how quickly the food will be eaten. ■ Replace empty platters with freshly filled ones. Don’t add new food to a serving dish that already contained food. ■ Discard any food left out at room temperature for more than two hours. ■ Hold cooked or reheated food above 140 F; place in hot holding equipment, such as chafing dishes, crock pots and warming trays. ■ Reheat previously prepared food to 165 F, using a stove, oven or microwave oven. ■ Place cold food in containers on ice. ■ Hold cold foods at or below 40 F.
■ Immediately refrigerate or freeze food that was not served. Discard leftovers of food that was served. ■ Divide food and place in shallow containers. Don’t put more than 2 inches of thick foods such as beef stew into each container. Soup and other thin foods should be no more than 3 inches deep. ■ Use or discard chilled foods on a regular basis. Don’t depend on maximum storage time. For more information, the “Food Storage Guide” (FN-579) is available on the NDSU Extension Service Web site. This publication is based on the “Fight BAC” campaign of the Partnership for Food Safety Education. NDSU Extension Service Web site. North Dakota Department of Health. Frequently monitor time and temperature of potentially hazardous foods. 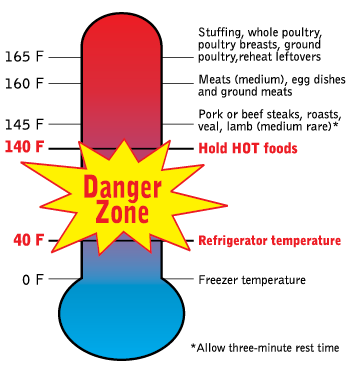 Bacteria multiply rapidly in the temperature danger zone (between 41 and 140 F). 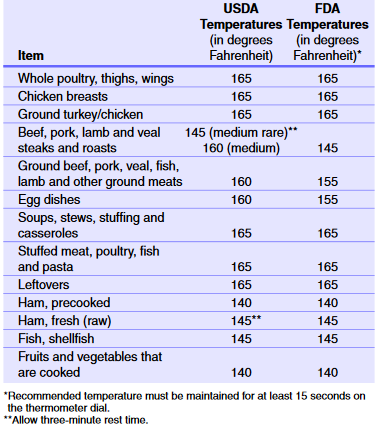 The following table shows the temperature recommendations from the USDA and Food and Drug Administration. USDA temperature recommendations commonly are used in consumer handouts. Food service establishments commonly use FDA temperature recommendations. Health inspectors use FDA guidelines in their inspections of food service establishments.